"Hi, my name is Pat and I am addicted to reading blogs!" Do you ever feel like there's just not enough time to read and respond to everyone? I love checking on my friends and the newbies that I see ~ just lacking the time right now. I'm on a mission to totally clean my closets and get everything organized. I started the process a few weeks ago and somehow got side-tracked. Well, last weekend I found a water leak in the ceiling of the closet in my bedroom. :-( We've had so much rain and it found its way in. I'm on the end of this building and there was a problem on the outside where the shingles had separated from the brick/roof. They fixed that area and now have to flood it to see if it's completely sealed before they replace the ceiling in my closet. Now that means that everything in that closet must come out. I'm going back through all closets and tossing and donating! I can't deal with disorganization so will do it now and I just know I'm going to be a happy camper when I'm finished. I won't be around for a few days but will try my best to check emails! I hope everything in your world is beautiful and happy. Oh, and I'll have a giveaway soon! I'm sorry to hear about the leak. Take the time you need to get things back to normal. 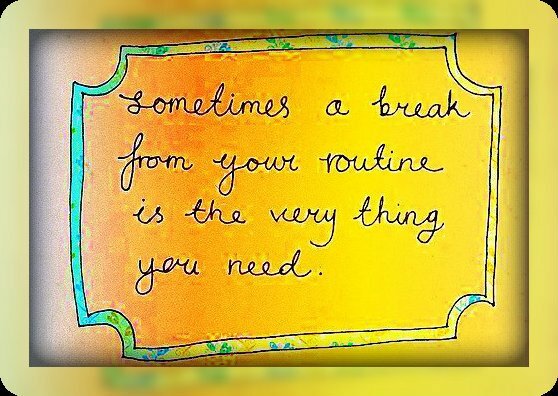 Everyone needs a break from time to time, not only to take care of business, but to change things up and come back refreshed. Try to have some fun in between the closet and the leak! I hate water leaks!! They are so much trouble!! Yeah.....my name is Linda and I am an addict of BLOG! closet to leak so I'll get into it also... but I'm sorry for your stress over it all..
Take that much needed break and don't be gone too long. Oh gosh, what a mess.....good luck. Hey, Pat! I know EXACTLY what you mean! Goodness! sounds like you're repeating the kitchen experience in your closet with everything having to be moved out. What a great time to clean, weed out and organize though! ... though I understand you were lured in by the pillow giveaway. And so sorry about the water leak. So nice to meet you! I hope your project is coming along nicely! I need to clean closets too! Thanks for your sweet comment on my blog! I've enjoyed browsing yours! Oh, what a bummer. Sounds like you are making the best of it! Enjoy your break and your newly organized closet. Love to you! I'm an expert on side-tracking, so I can relate! Have fun organizing your closet, (something I should do too) if I ever get off the internet! Enjoy your break Pat..hope it is as productive as you would like and need.